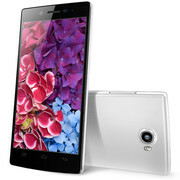 The iOcean X7 is yet another smartphone from the People's Republic of China which reaches the European market. The seemingly high-end device has an RRP of 249 Euros (~$317). 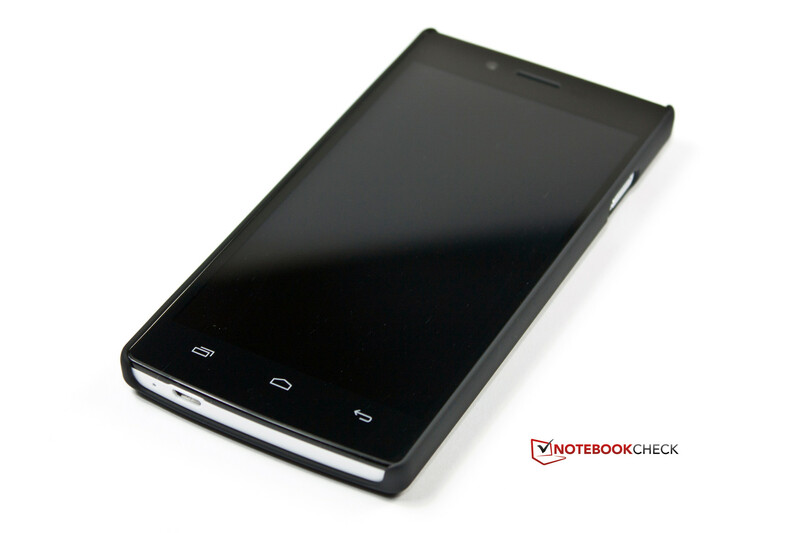 Our partner www.cect-shop.com, who provided us with the test device, offers the smartphone for 199.99 Euros (~$255). Performance is delivered by a SoC made by MediaTek, which is powered by a Cortex A7 processor with four cores. 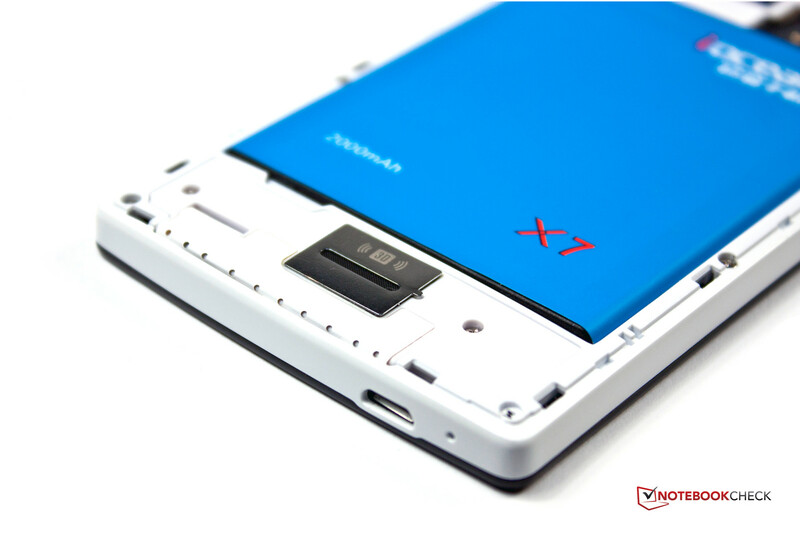 Like most other smartphones from China, the X7 has room for two SIM cards. The device is visually simple and is made entirely of plastic. There is a wide range of competitors, because based on the hardware the X7 must compete with high-end devices, but price-wise it is positioned between the entry and middle level. 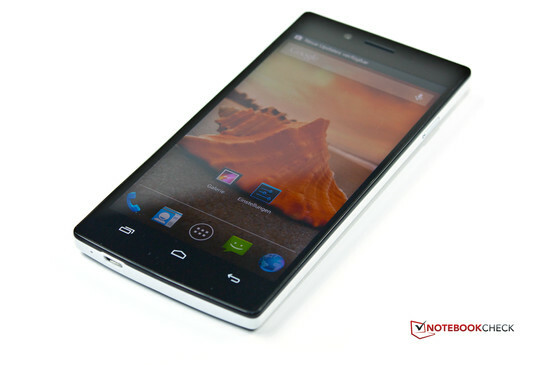 Therefore the Google Nexus is one rival and so is the Amoi N828. But other dual SIM phones such as the Samsung Galaxy S DUOS and the Sony Xperia E dual are also in this price range. Simple design: the iOcean X7. 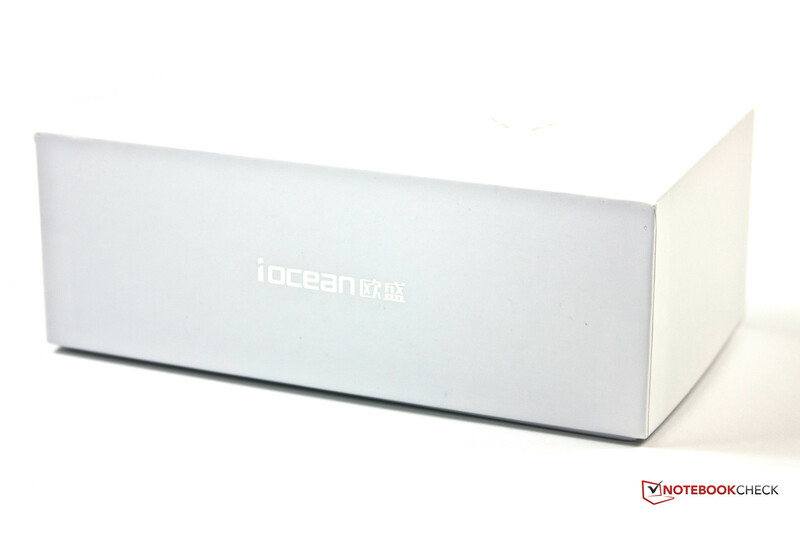 At 141 mm length, 68.7 mm width and 8.9 mm height, the iOcean X7 has dimensions similar to other devices of this price range. The 5.0-inch screen takes up most of the space, while the usual three Android touch buttons are located below. Above the display are the ambient light and proximity sensors, the front camera, and the ear speaker. The case is made completely out of plastic and does not seem to be of high quality, but it appears to be largely resistant to fingerprints. Due to the weight of 147 grams it sits well in the hand and even weighs less than indicated. 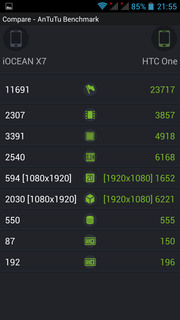 Other 5-inch devices, such as the Sony Xperia Z (146 g) and the HTC One (143 g), are similarly heavy. The design of the X7 is unremarkable. The lens of the main camera is decorated by a chrome ring. In addition to that, the two physical buttons (power and volume) also come with a metal look. The workmanship seems neat, but pressing on the back of the device leads to visible changes on the display. In addition, the display backlight shines through the thin gap between the screen and the housing. Otherwise the gaps are even. The thin battery cover is attached to the housing by 15 plastic hooks. Thanks to the recess at the bottom left corner, the cover can be easily opened. 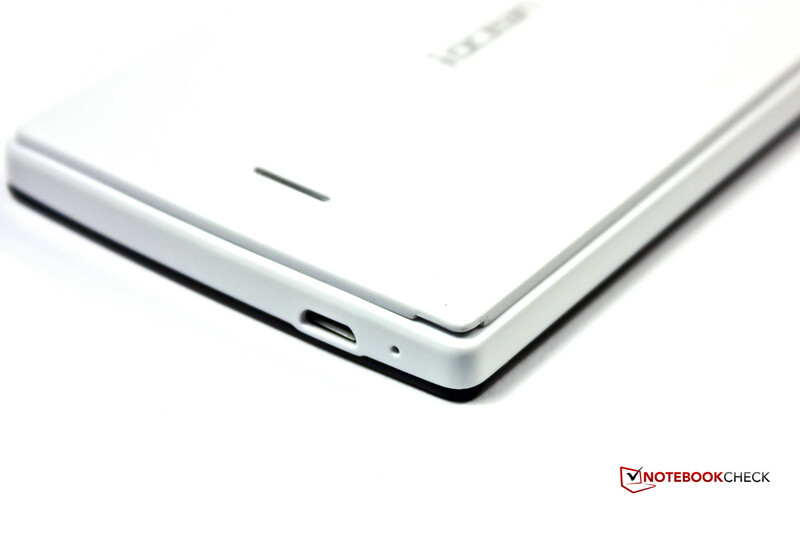 Below is located the 2000 mAh battery, which is replaceable. The two SIM slots and the card reader are easy to reach. 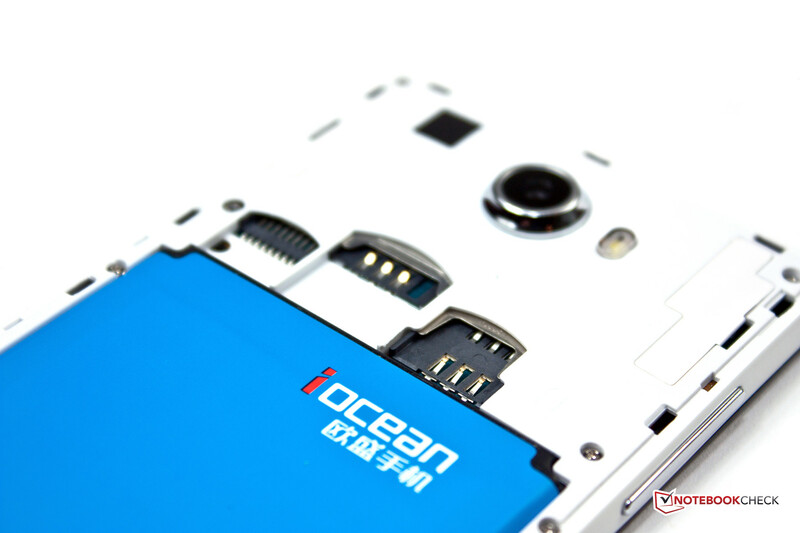 The iOcean X7 is equipped with the MT6589 SoC by MediaTek and also features 1 GB of RAM. In addition we have 4 GB of flash memory, of which 1.22 GB is available. This can be expanded up to 32 GB via the microSD card reader. 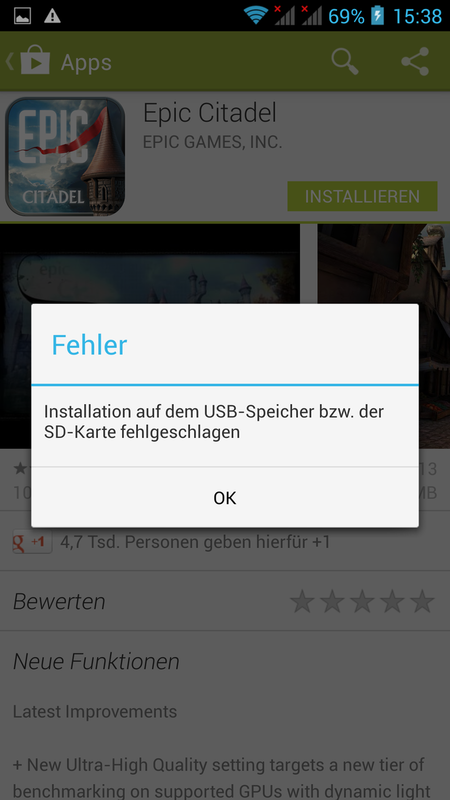 During the review, we noticed that some larger applications could not be installed. One possible cause could be missing access rights to the memory. However, even after extensive research, we could not resolve the problem, which seems to not be associated with intervention into the system. 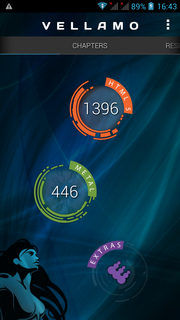 The interfaces are quite spartan. The case only has one 3.5 mm audio jack and one micro USB port. The audio jack worked satisfactorily, but the plug of the supplied headset could not be fully inserted. The SIM slots were a small surprise. Here we did not find two standard SIM card slots (mini SIM), but one. The other is a micro SIM slot. Both can be easily managed via the Google operating system. Bottom: microphone and micro USB 2.0. 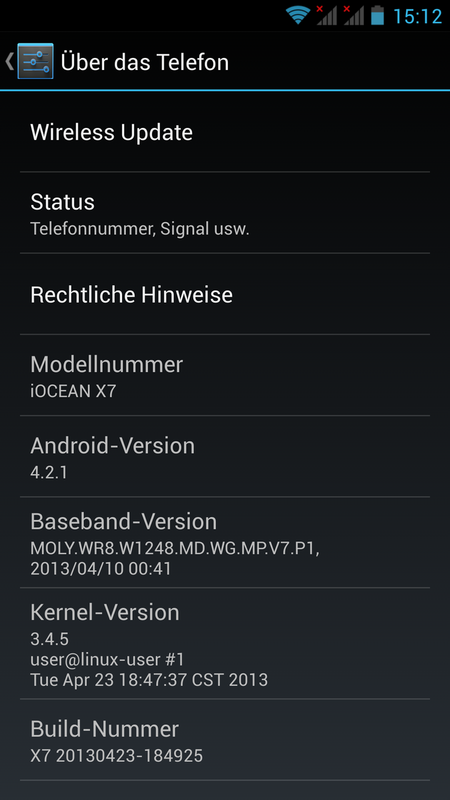 The operating system is Google's Android version 4.2.1. 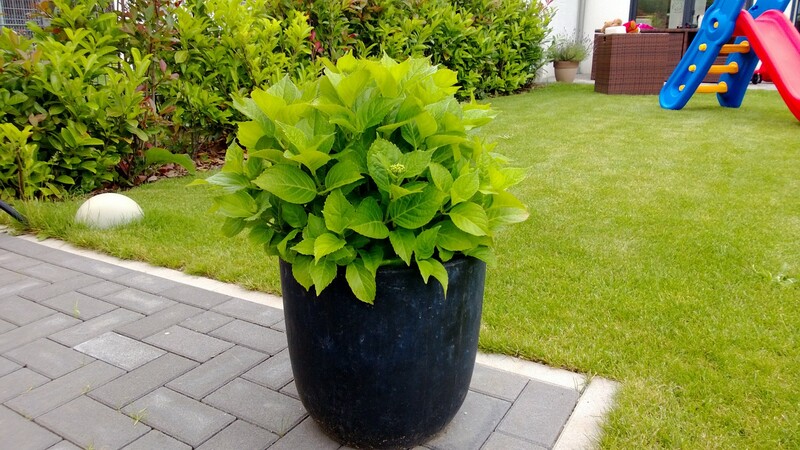 This is a pure Android, without any additional software. 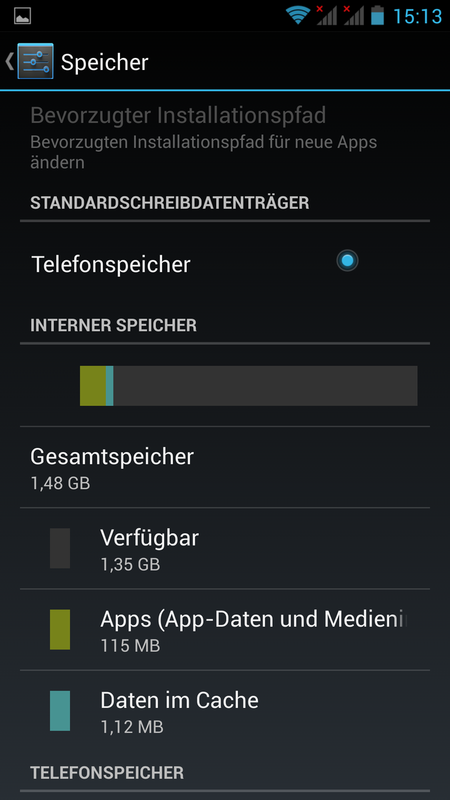 Most of the preinstalled apps are not usable by most Europeans because these are Chinese applications. 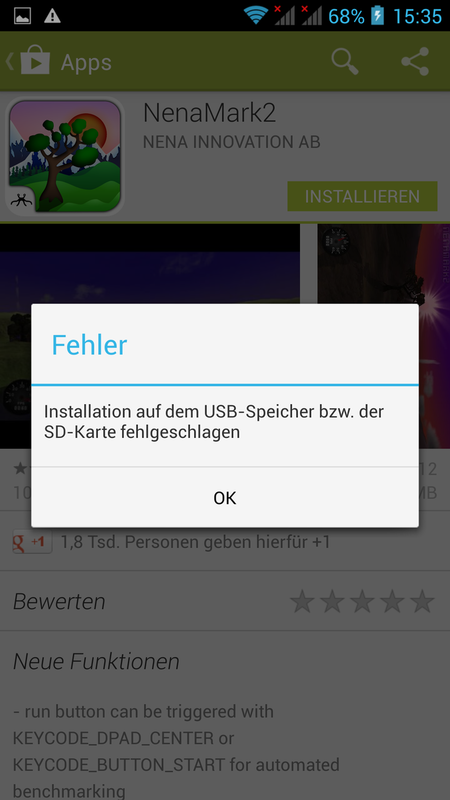 More understandable applications can be downloaded via the Play Store. 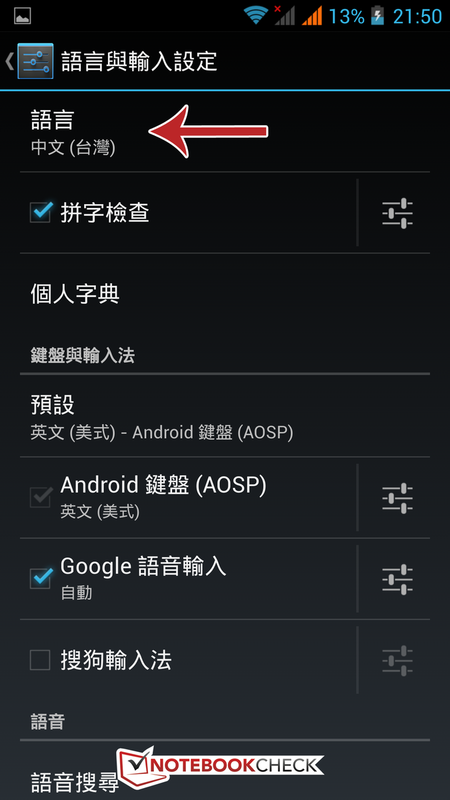 The Asian language is quite a problem for Android newbies, because the default system language is also factory set to Chinese. 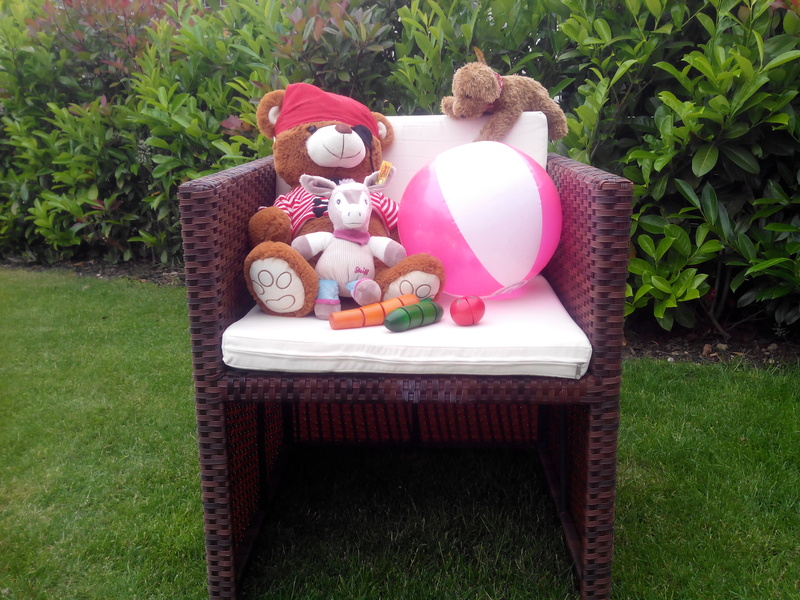 We have therefore created a small photo gallery with the steps needed to change the language. 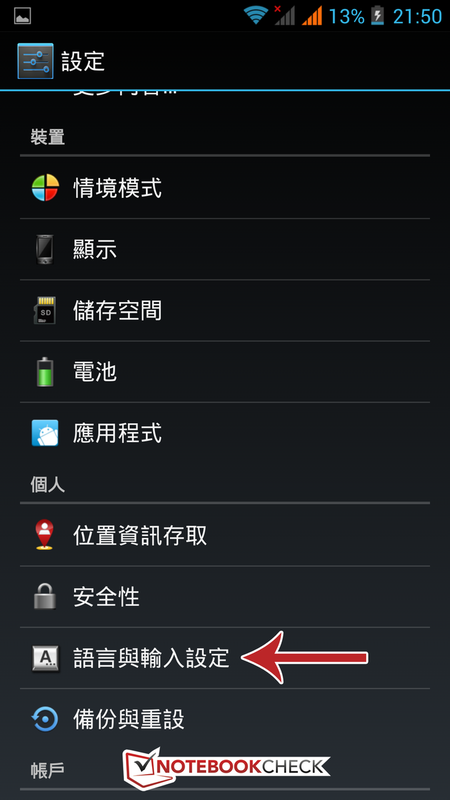 After the selection, the device must be restarted in order for it to be able to fully display the chosen language. 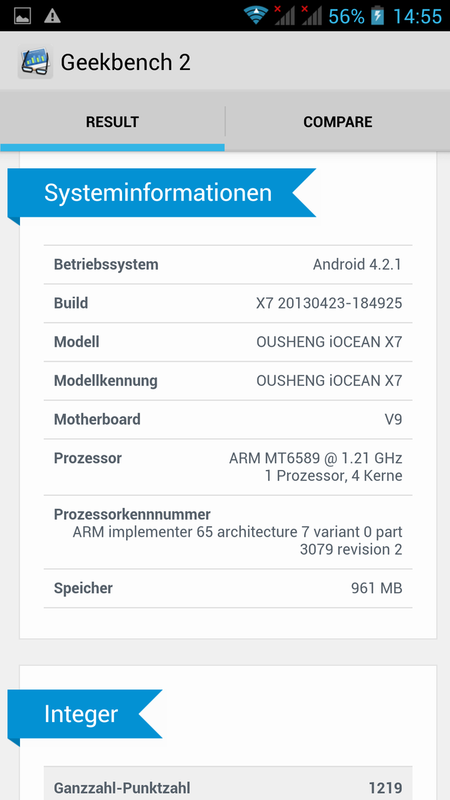 Unfortunately, this build of Android 4.2 is not completely translated, but still includes several English texts. 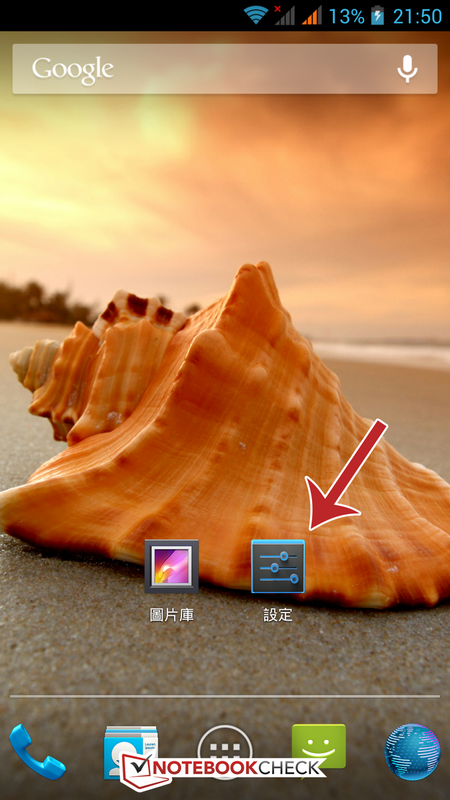 First, scroll right to the home screen and press the Settings icon. Then, scroll down and select the language menu. Choose the top option (Language). Choose the desired language. Done. Good news first: the GPS receiver works. The exact position was locked in after about two minutes, but only under open skies. Even in the vicinity of buildings, this took considerably more time. In rooms, even right next to the window, we did not get any signal. The WLAN module supports the IEEE 802.11 b/g/n standards and transmits in the 2.4 GHz bandwidth. 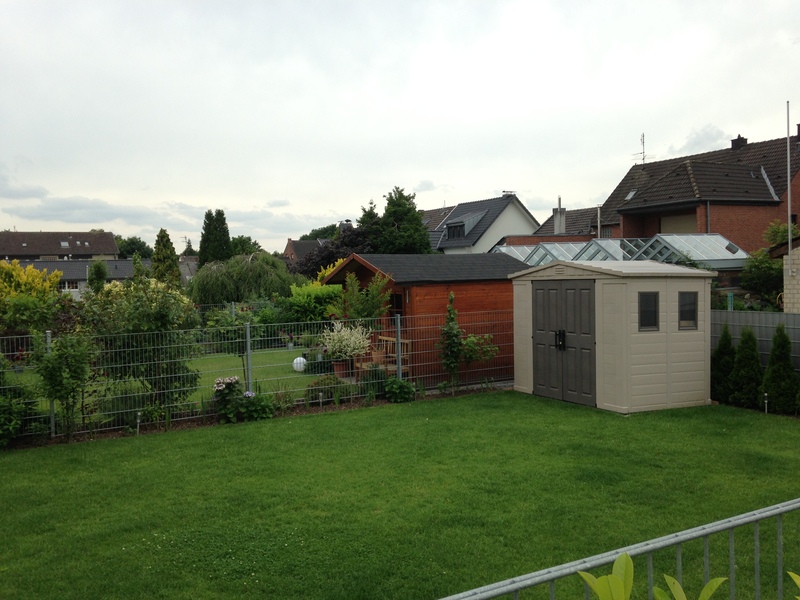 Even outdoors, at a distance of 25 meters to the router, the X7 had good reception and loaded websites quickly. A good performance. For data transmissions over mobile networks, the devices relies on the HSPA+ standard and reaches download speeds of 21 Mbps and upload speeds of 11 Mbps. Faster data transfers or LTE are not supported. Bluetooth version 4.0 is also on board. 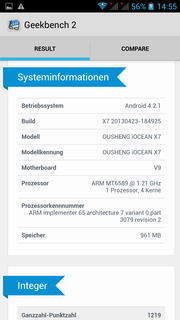 The iOcean X7 works with Google's integrated telephone function, without any changes. 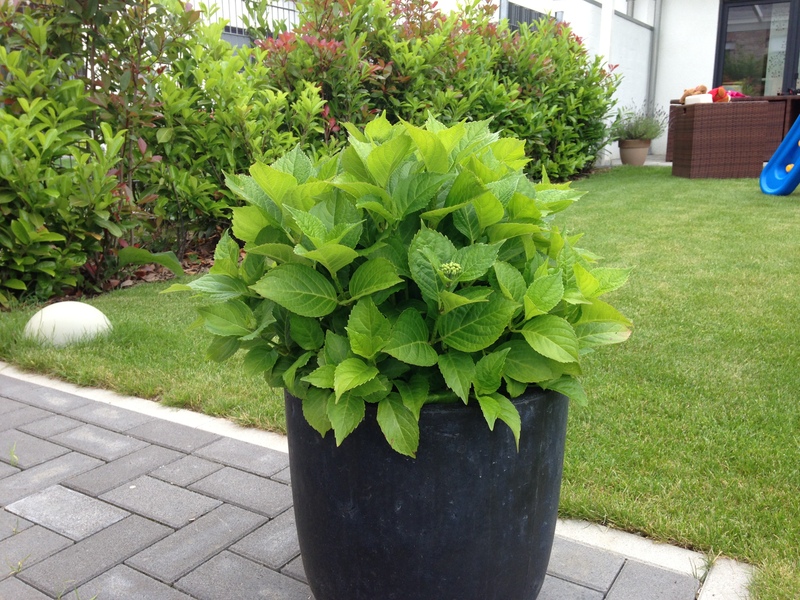 The latter is not absolutely necessary, since the software is intuitive and reliable enough. 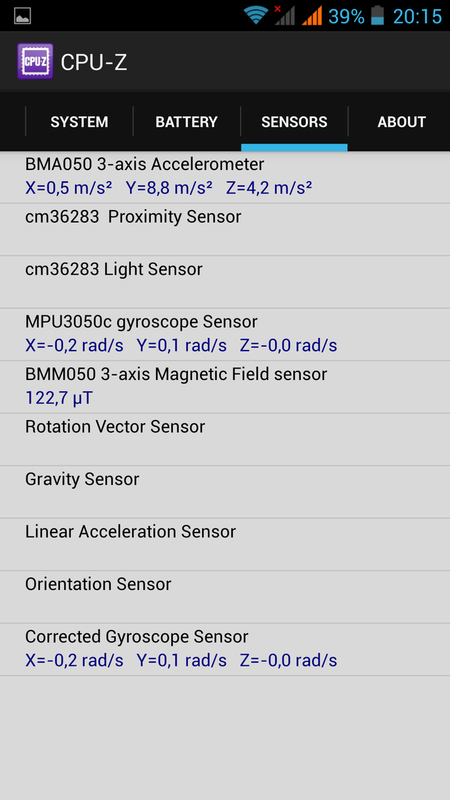 The integrated proximity sensor works well and deactivates the touchscreen at a distance of about ten millimeters. The iOcean X7 wants to impress, just as the big players do, not only with the display size, but also with the 12.6 megapixel (4096x3072) main camera (including image stabilizer). But the X7 loses painfully to the high-class competition such as Apple, Google and Nokia. Although the photos are quite good-looking for a cell phone camera in this price range, they are somewhat too dark. The sensor is overburdened especially when shooting against the light. In our scene comparison, one can easily recognize overexposure. The pictures look blurred, especially at a closer inspection. 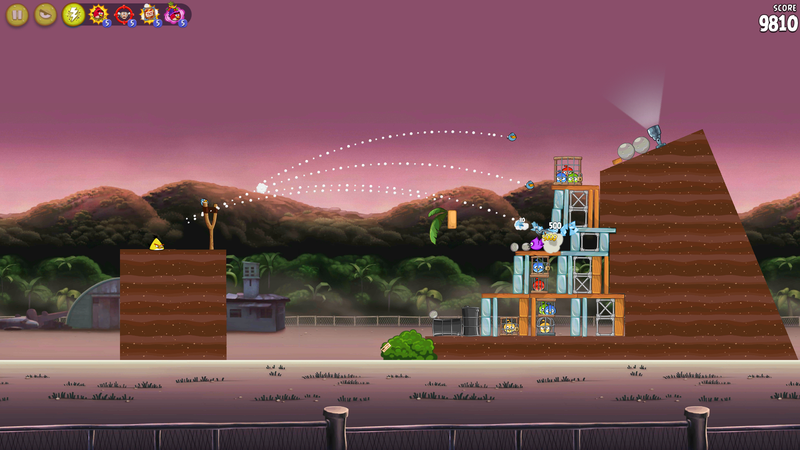 They are simply missing more depth of field. 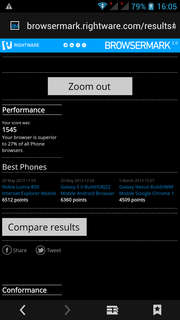 The iPhone 5 and the Lumia 920 are very good in this area. The X7 shows visible image noise in low light, even with the LED flash. So, despite its good specifications, the camera remains only mediocre. 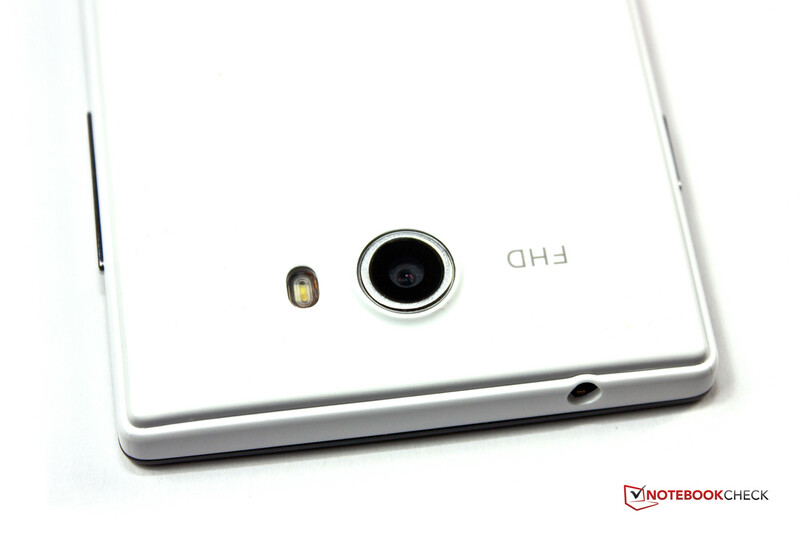 The front camera is used mainly for video calls and has a relatively good resolution of 1752x1168 pixels. The webcam can record videos in 720p (1280x720 pixels) and the main camera can do this in Full HD (1920x1080 pixels). iOcean X7: ISO 111, F/2,4. iOcean X7: ISO 112, F/2,4. 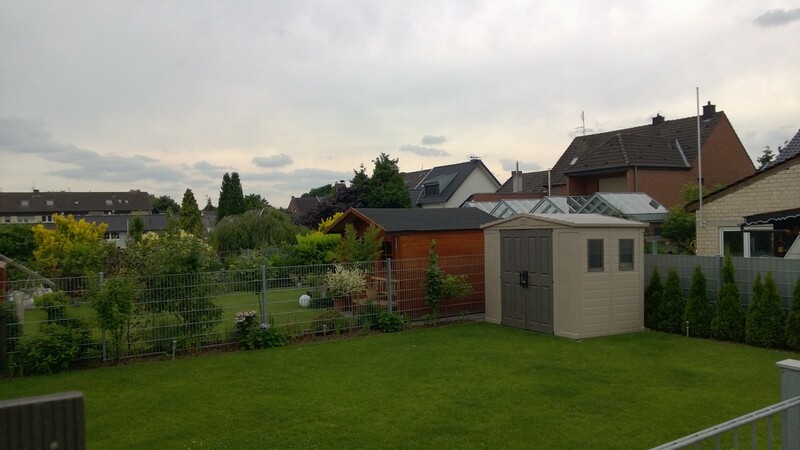 Google Nexus 4: ISO 100. Apple iPhone 5: ISO 50, F/2,4. Nokia Lumia 920: ISO 100, F/2,0. Reference: Sony Alpha 57: ISO 100, F/5,6. Reference: Sony Alpha 57: ISO 100, F/6,3. Reference: Sony Alpha 57: ISO 100, F/11. 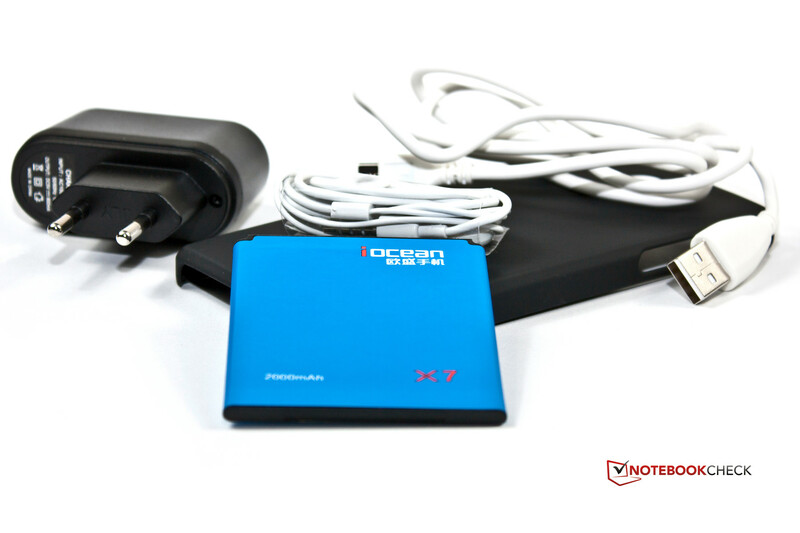 The accessories of the iOcean X7 are mostly standard. In addition to the AC adapter and a data cable, there are the 2000 mAh battery and the screen protector. The supplied headset is not exactly high quality, but it does a solid job. If you purchase the phone from the CECT-Shop, you will also get a second 2000 mAh battery as well as a black case, which should protect the smartphone. Further optional accessories by the manufacturer include a case with a 3000 mAh battery (from 30.35 Euros, ~$38) as well as another cover in blue and orange (each from 12.14 Euros, ~$15). The manufacturer supplies the phone with one year warranty. In some countries the obligatory 24 month warranty applies. But should it come to actually using it, the X7 must be sent to China for repairs. This not only takes a long time, but additional customs fees may apply. The capacitive touchscreen has good gliding properties and responds to inputs quickly and precisely. 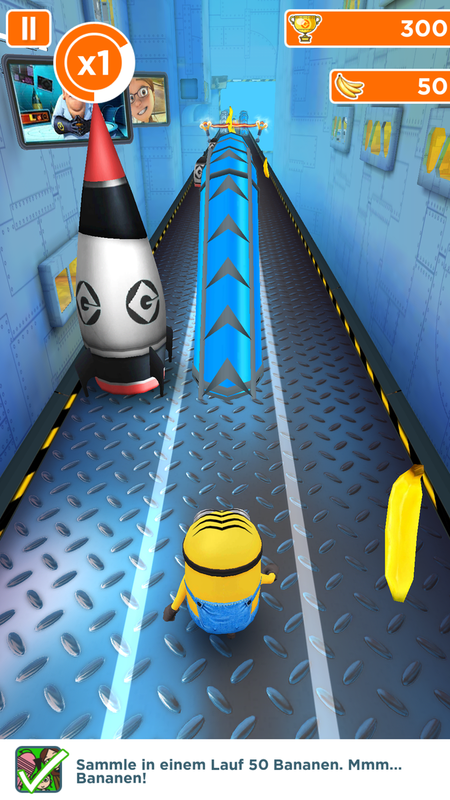 Occasionally, when using the Play Store, a button would require repeated tapping until it finally reacted. 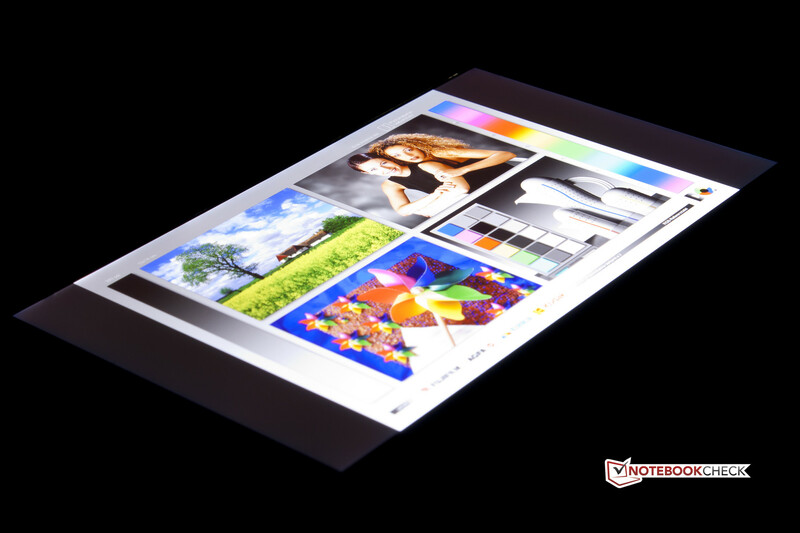 The display recognizes up to five fingers simultaneously and works reliably even at its edges. The virtual keyboard is the standard Android one, which is equipped with automatic correction and a dictionary. 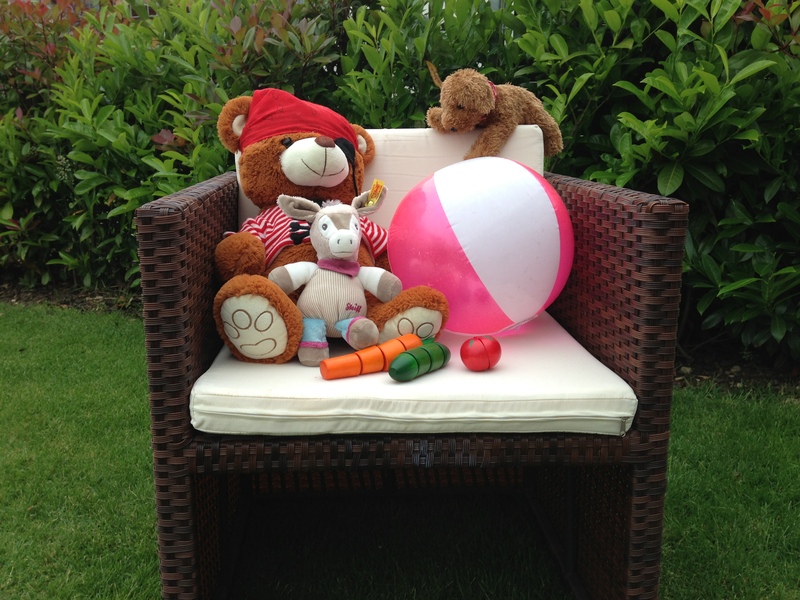 Further features and alternatives can be downloaded from the app store. 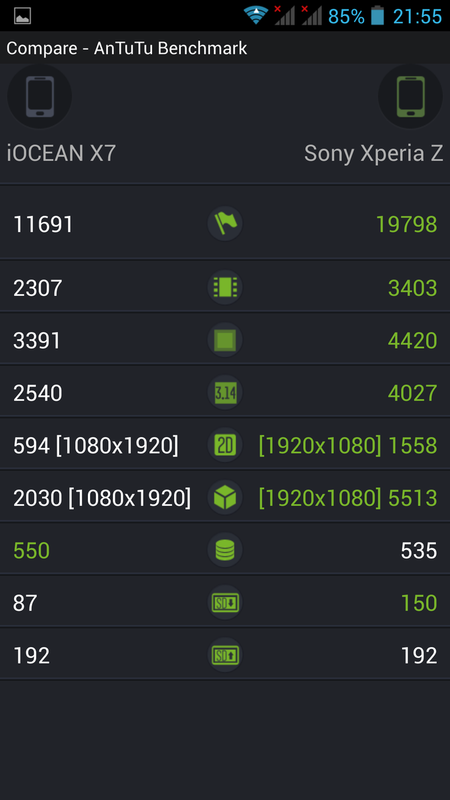 Not only is the 5-inch IPS display unusual for this price range, but also the resolution of 1920x1080 pixels. 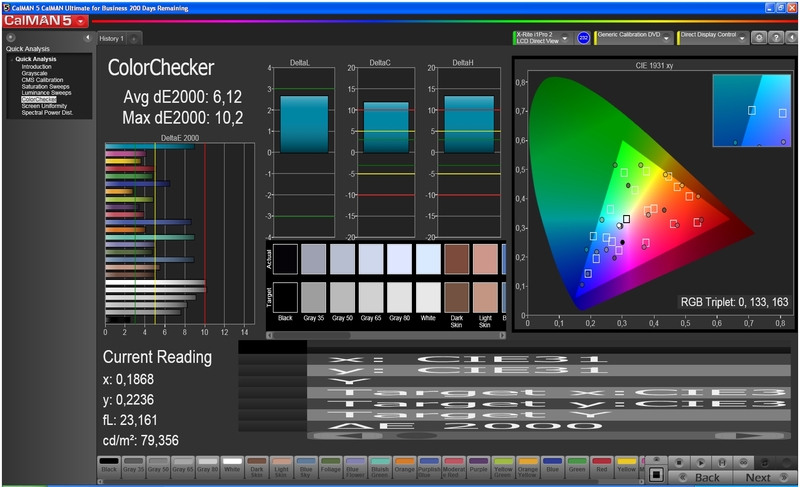 The Full HD panel in the 16:9 format has a pixel density of 440 PPI. 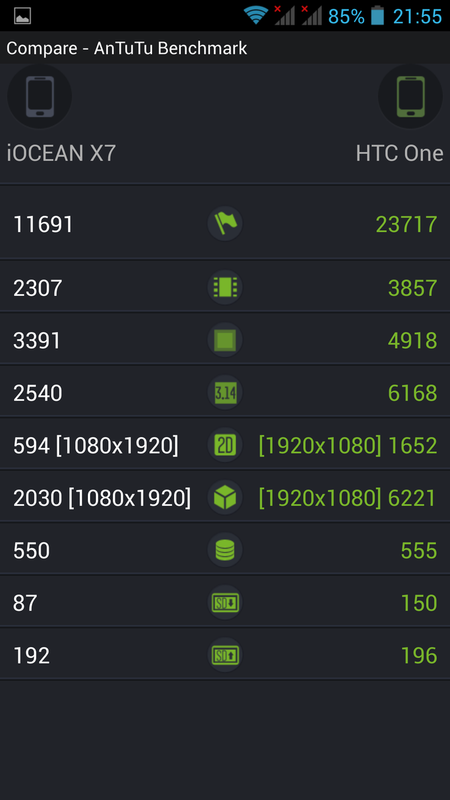 The Amoi N828 (960x540 pixels) does not have an HD resolution and even the somewhat older Nexus 4 (1280x768 pixels) cannot compete here. 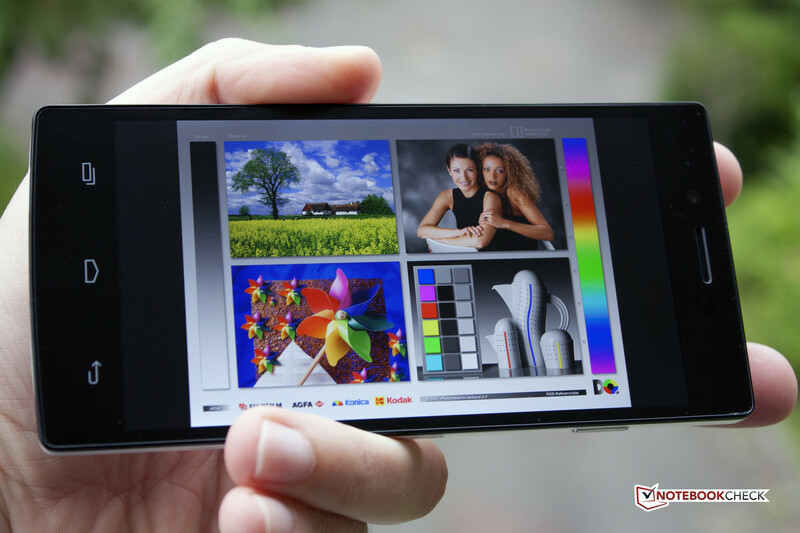 In order to find a comparable smartphone, we need to take a look at the current flagship devices, such as the HTC One, the Samsung Galaxy S4 and the Sony Xperia Z. 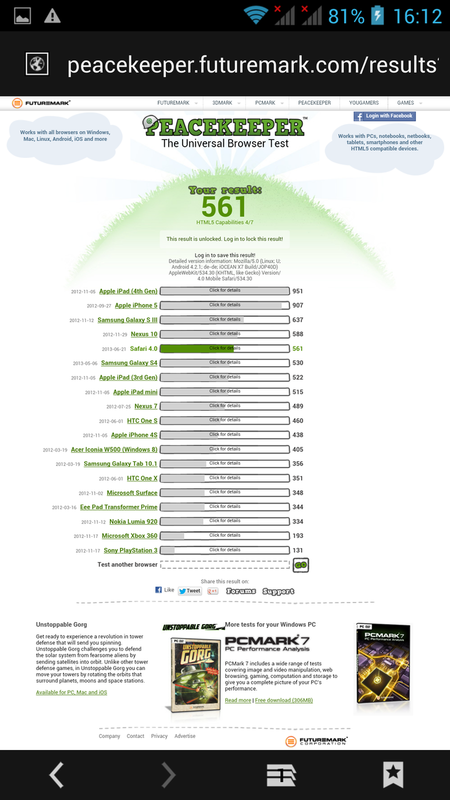 The display's average brightness of 330 cd/m² is quite good and beats the Google phone (275.3 cd/m²). But neither of them can reach the superior brightness of the Amoi (501.4 cd/m²). The illumination of 86% is also a very good value for the X7. 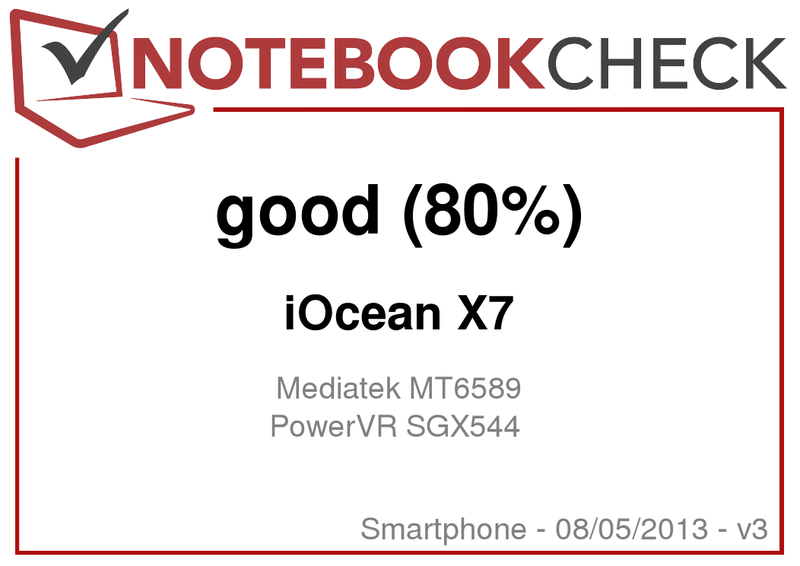 The black level of the iOcean X7 is 0.55 cd/m² - a mediocre value and is slightly worse than the competitors Amoi and Google. 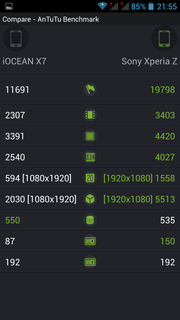 The contrast ratio of 651:1 is also far behind the N828 (1317:1) and the Nexus 4 (1648:1). Nonetheless, in reality it is quite sufficient. 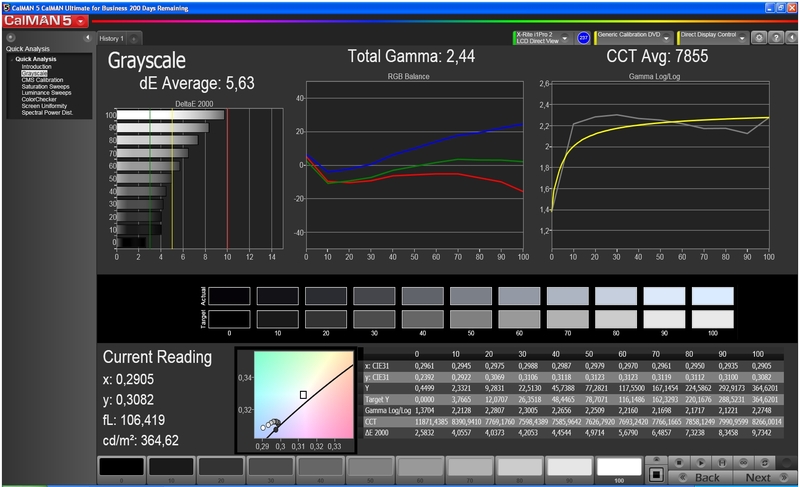 We measured color accuracy with CalMAN 5 and observed strong deviations from target in the white, cyan and red colors. The DeltaE for these three is just below 10. We got the same impression from the color saturation, but here red showed the largest deviations and was presented more as dark orange. 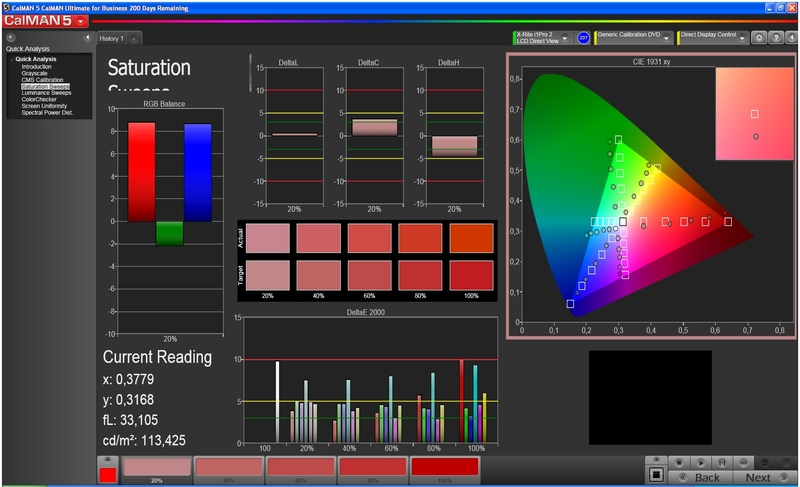 In reality, the color reproduction of the X7 seems full and the deviations can be noticed only by a trained eye. 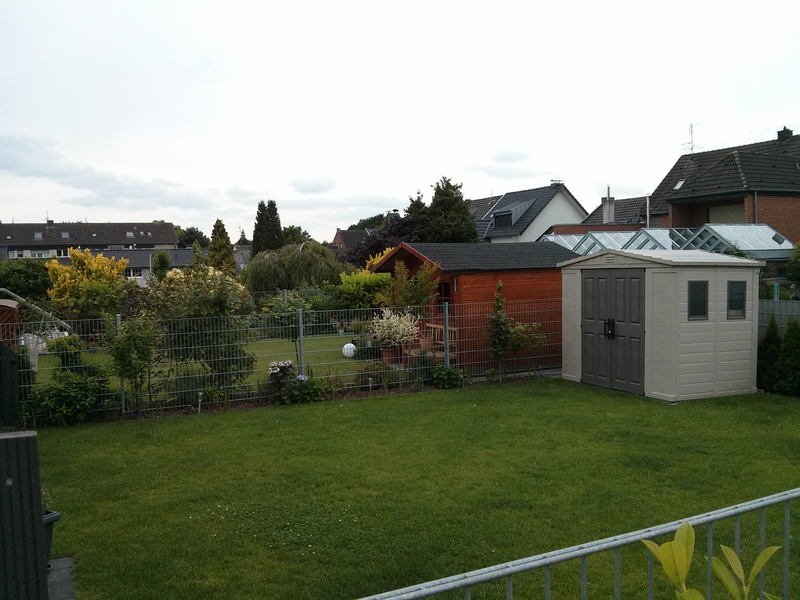 In terms of outdoor use, the iOcean X7 delivered a solid performance. 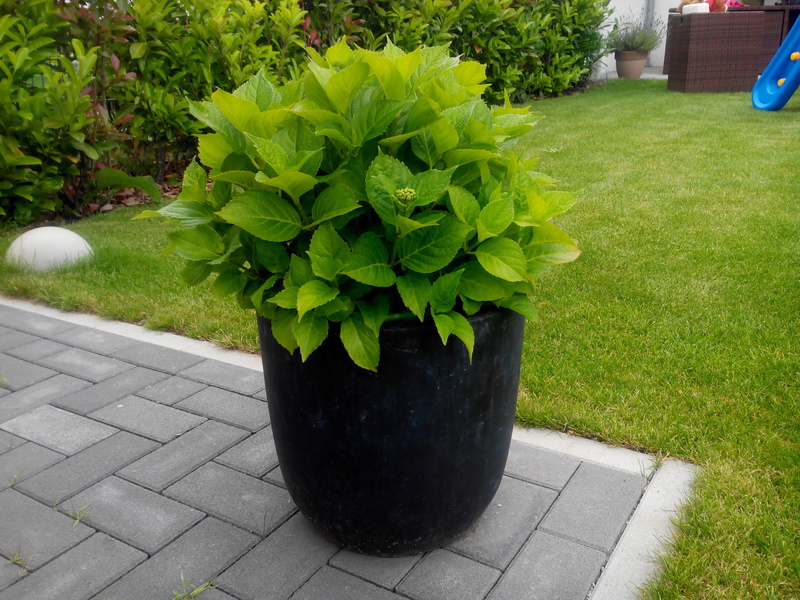 In shady areas or under a cloudy sky, the display is easy to read. Only in direct sunlight is the user forced to try harder to recognize anything. The ambient light sensor does not function perfectly and therefore one must manually set the display at maximum brightness when travelling. The viewing angle stability of the iOcean X7 is very good, because of the IPS display, and confirms our high expectations of a panel of this type. Even at extremely flat angles there are no color inversions. Unfortunately, we noticed small bright patches when black images are displayed. 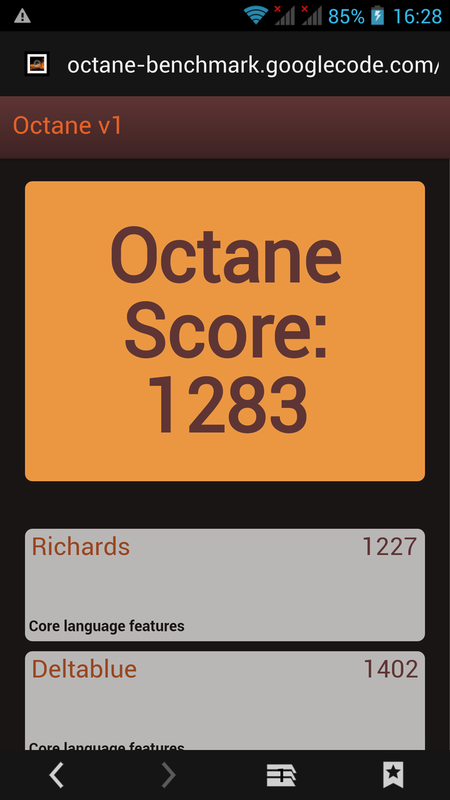 Also, the backlighting along the edges of the display is visible at any time. This is unfortunate, since we were expecting better quality here. The MT6589 SoC by MediaTek is a quad-core processor based on the Cortex A7, which can clock each core between 497 MHz and 1201 MHz. If the processing power of one core is not needed, it is quickly turned off in order to save energy. The processor is supported by 1 GB LPDDR2-RAM, working at 533 MHz. 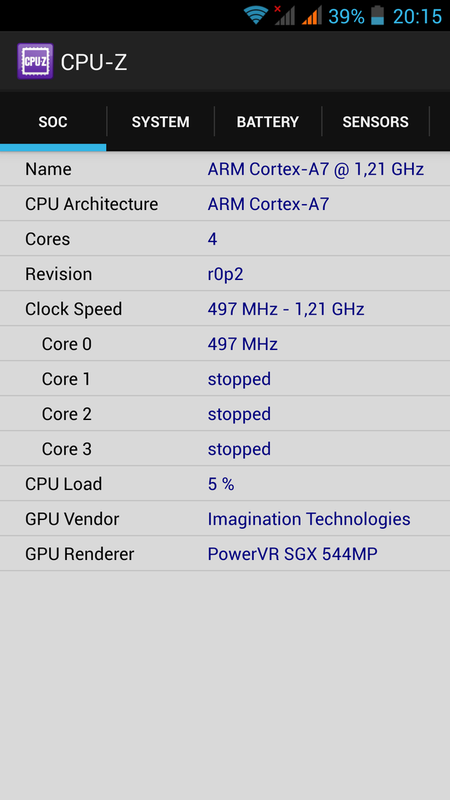 In terms of GPU we have a PowerVR SGX544, similar to the one in the Samsung Galaxy S4, although the model in the X7 is significantly slower (286 MHz). Despite the relatively cheap SoCs from Taiwan, the iOcean X7 reached good results in the synthetic benchmarks, although not on par with the top smartphones. This clearly separates the wheat from the chaff. In everyday use though it is hard to notice. 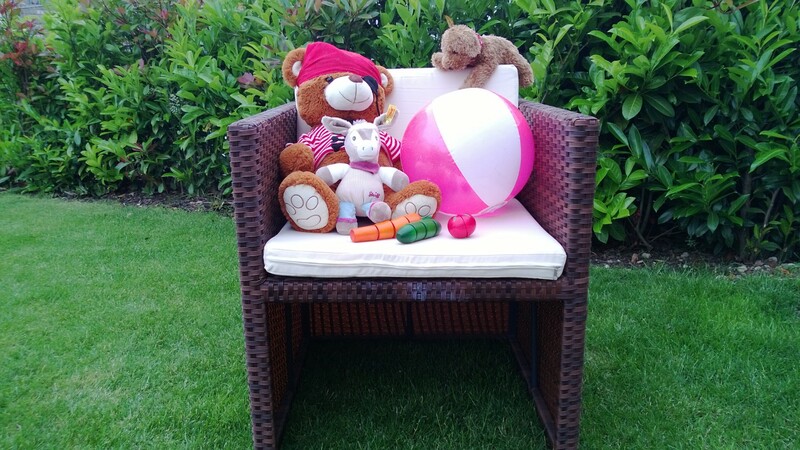 The Android operating system runs smoothly and loading times for smaller applications are fast. The iOcean X7 loads websites quickly. 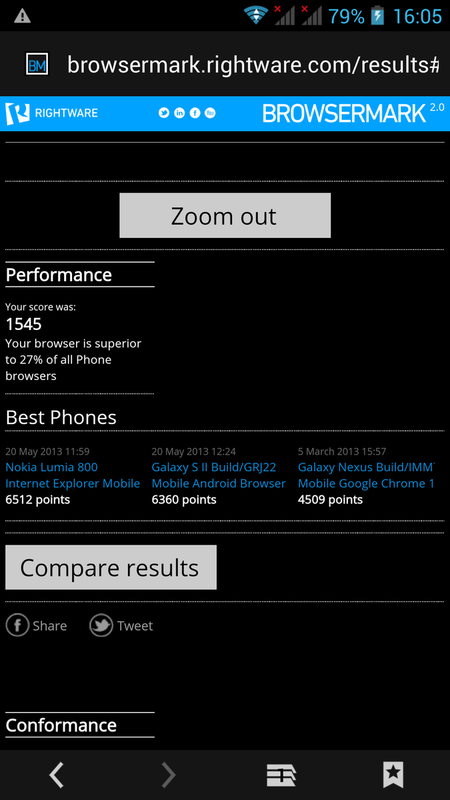 Browsing the internet is a joy not only thanks to the large screen, but also due to the good performance. 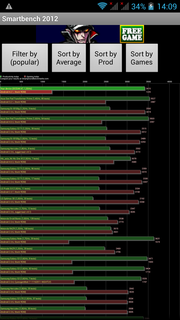 The benchmarks confirm our positive impression. 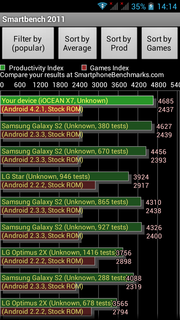 The Google Nexus 4 and the Amoi N828 are slower in all comparisons. 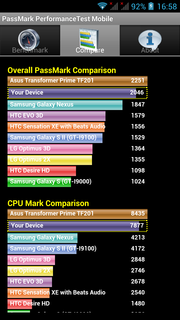 The 4 GB large flash storage of the X7 is properly quick and is beaten only by the Nexus 4. 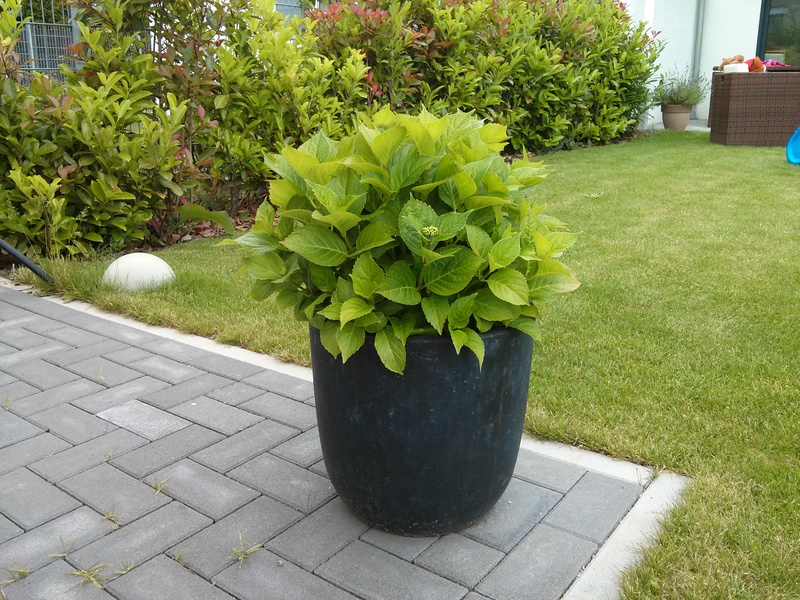 The only drawback is the lack of certain rights, which makes the installation of some larger applications impossible. This is the reason we could not run some benchmarks on the device. Fast & Furious 6: The Game (173 MB) could not be installed, while Dead Trigger (156 MB) could. 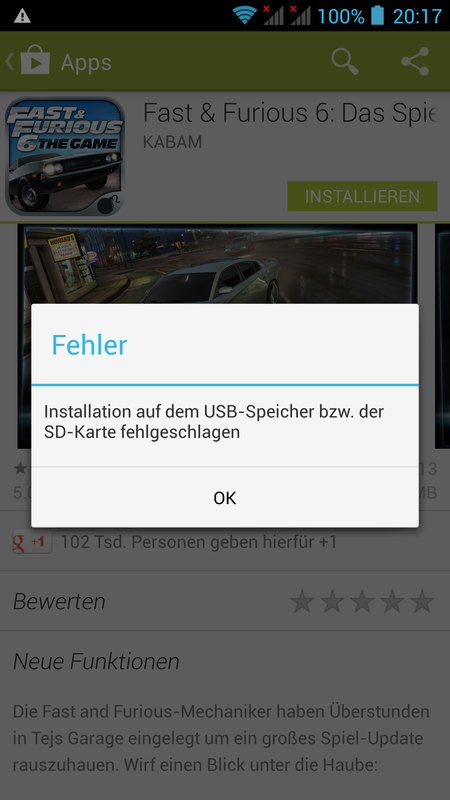 During the installation of Real Racing 3 the smartphone even crashed. The integrated PowerVR SGX544MP provides sufficient power, in order to play most games on the iOcean X7 without problem. 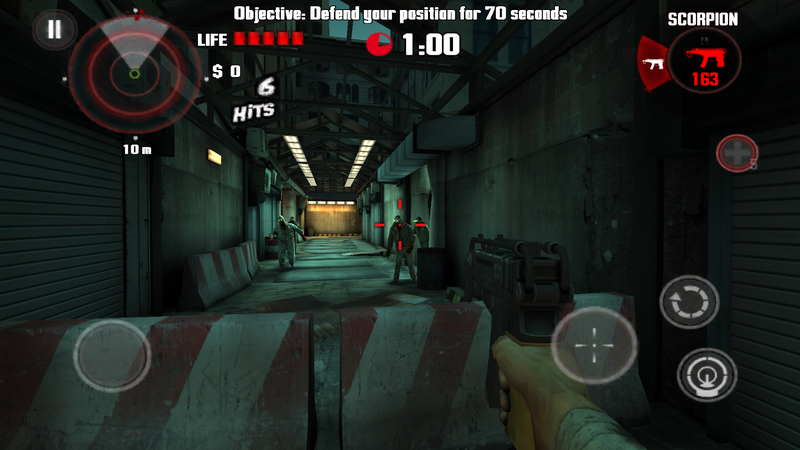 3D shooters like Dead Trigger run as smoothly as Minion Rush and the classic Angry Birds. The good touchscreen works well. The gyroscope and the accelerometer also do their job flawlessly and contribute to the uninterrupted fun. We clearly understood our conversation partner, though the volume could be a bit louder. We were also well understood on the other side. Calls via the loudspeaker were similar - voice quality was good, but the microphone was regularly missing some of our words and the call was therefore choppy. The supplied headset should best be used just as headphones, because the microphone turned out to be useless. The other party could hardly understand us. The surface temperature of the iOcean X7 never exceeded the 38 °C mark. 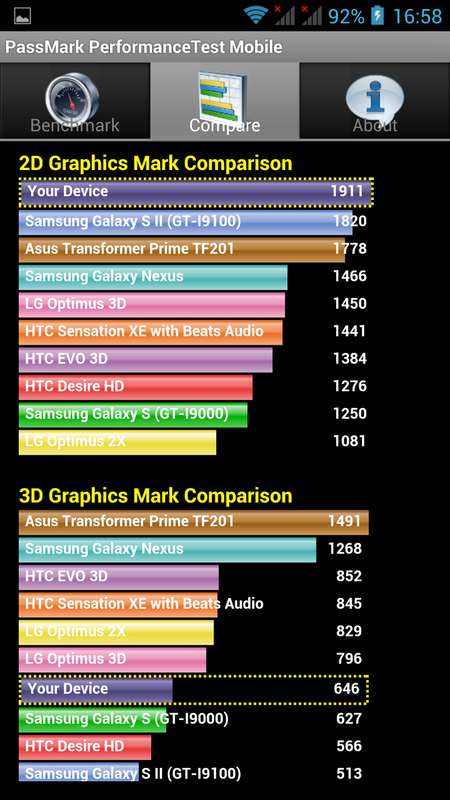 Even under full load the CPU and the GPU remained relatively cool. 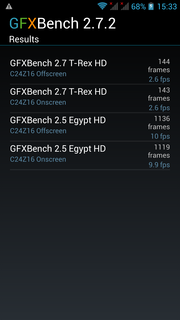 The more powerful Nexus 4 is about five degrees warmer (maximum 43.2 °C). 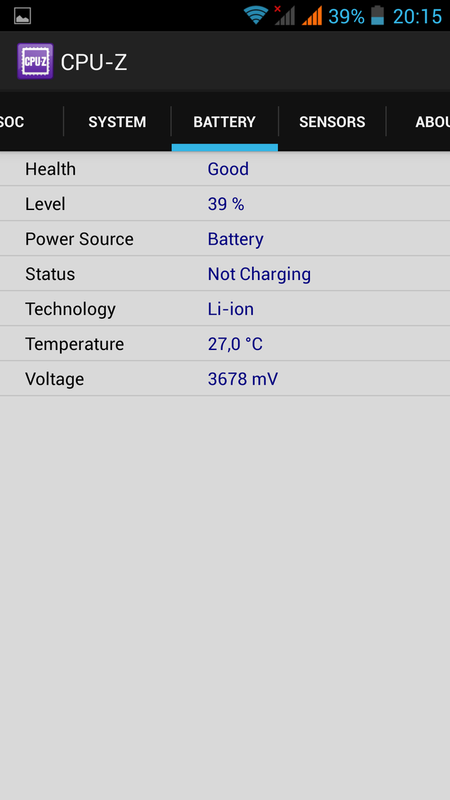 In idle use the X7 is not even lukewarm at 35.9 °C, only the Amoi N828 (33 °C) is slightly cooler. 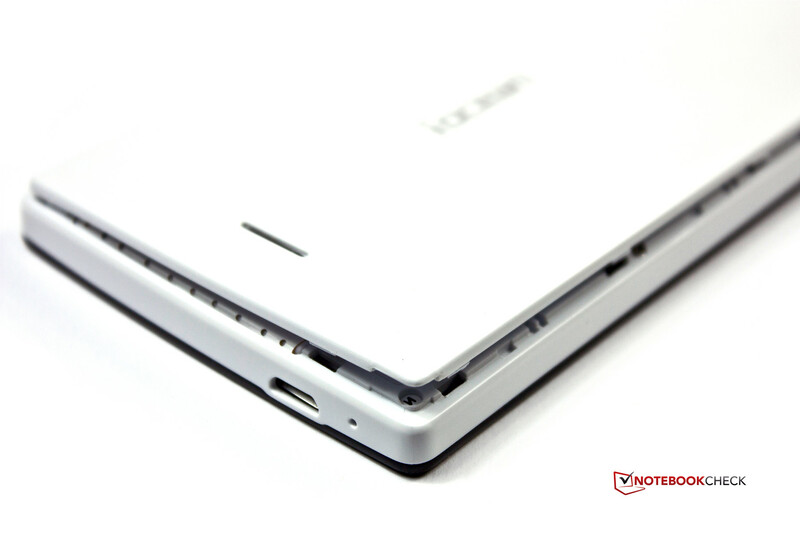 The manufacturer has managed to find a good balance between performance and heat dissipation. 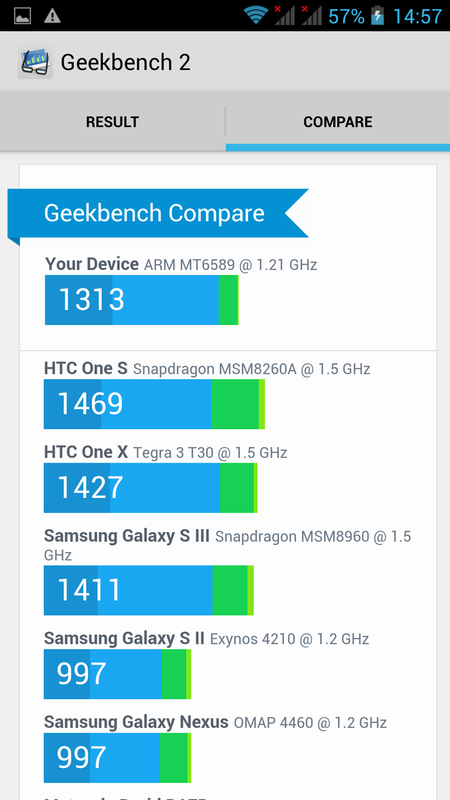 There are certainly smartphones that emit less heat, but those also have lower performance. The speaker, integrated on the back side, offers 3D sound. In fact, it does its job quite well. Sound is a little tinny at high volume and the bass and lows are barely there. However, the small speaker can be really loud, so that playback is audible when travelling or in a noisy environment. We weren't expecting wonders and we did not get any, but the X7 does offer a good sound quality. The audio jack also performs its job well. 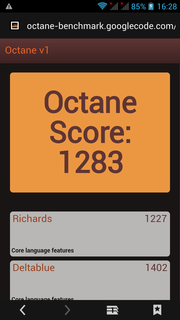 The energy consumption of the iOcean X7 is relatively moderate. 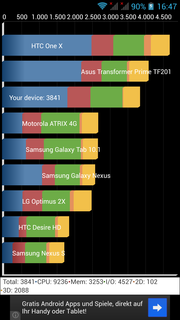 The biggest consumer is the 5-inch IPS screen, so even in idle use, with maximum brightness and activated WLAN, the energy consumption reaches up to 3.3 W. The Amoi N828 consumes 2.4 W in this scenario and the Nexus 4 just 1.4 W.
With the help of the Stability Test application, the CPU and the GPU were pushed to their limits, the wireless modules were activated, and we measured a maximum consumption under full load of up to 4.9 W. Here, the X7 is positioned between its rivals. The similarly equipped N828 draws only 2.6 W and the powerful Nexus 4 (6.5 W) consumes almost as much as the two devices together. 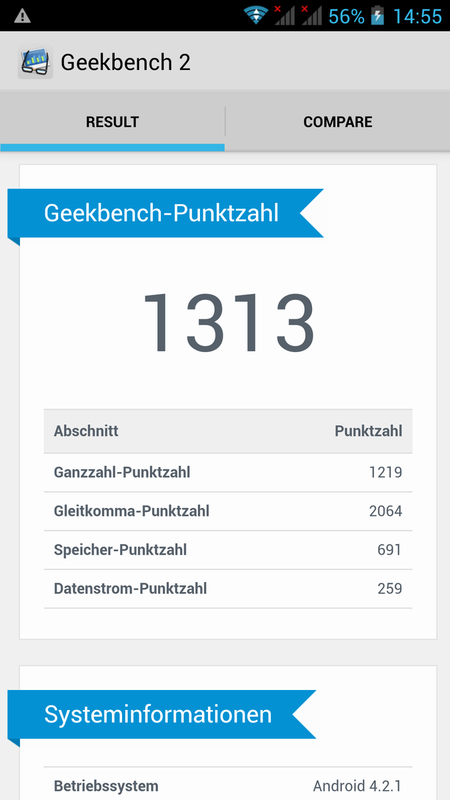 In standby mode and when turned off, our test device still consumes 1.5 W. This is definitely too much. In addition, the 4 W AC adapter is slightly undersized. 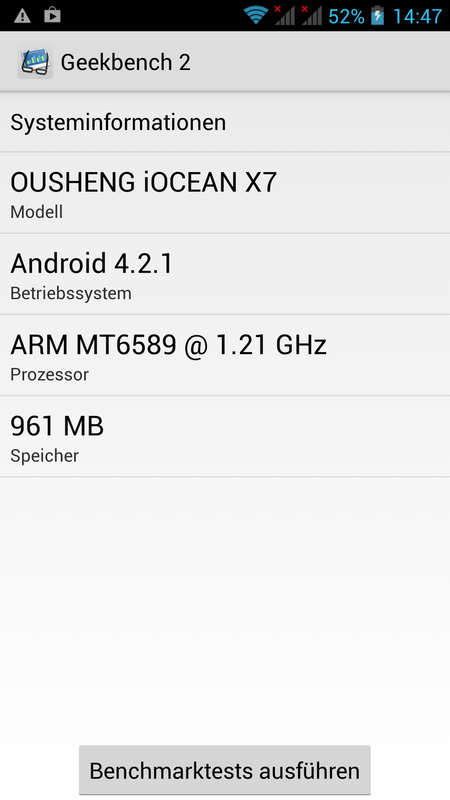 With its 7.6 Wh battery, the iOcean X7 can only reach mediocre runtimes. In idle use the battery lasted almost 13 hours. The device surprised us positively with its minimum runtime. Here it lasted three hours and 20 minutes before the lights went out. This is far from a record breaking value, but considering the display size and the high consumption it is acceptable. 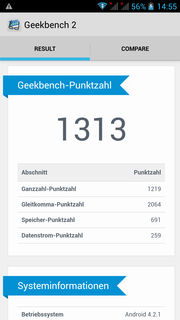 Our WLAN test is closest to a real situation. 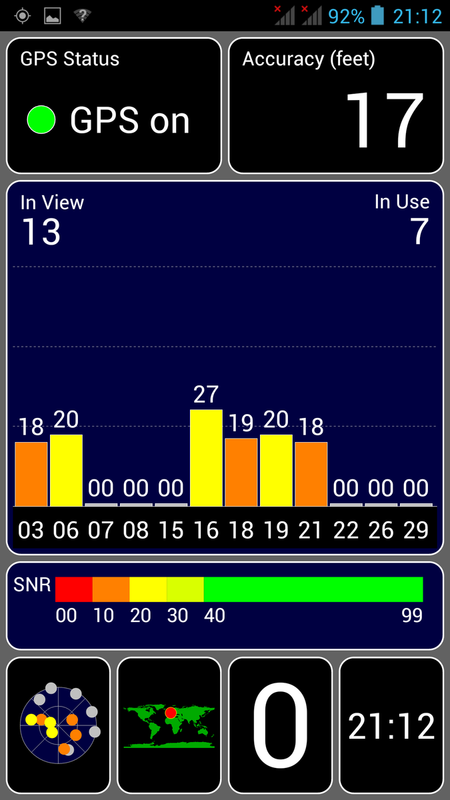 The display brightness is set at 150 cd/m² and various websites are loaded via WLAN. The phone lasted seven and a half hours without AC power - a decent value. If that is not enough, you can opt for an optional battery with 3000 mAh capacity, which should provide about 50% longer battery life. Clients of the CECT Shop have the advantage of a second battery, which can be exchanged in case it is needed. 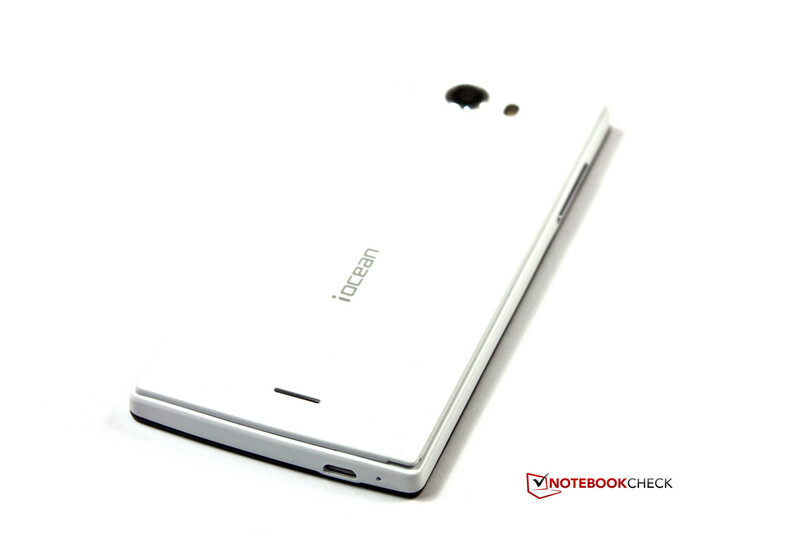 Is the iOcean X7 a high-end smartphone? Definitely not. But it is a good mid-range mobile phone with spectacular features. A 5-inch Full HD IPS panel in a device that costs less than 200 Euros (~$255) is a pretty strong purchase argument. The current Android version and the good quad-core SoC provide the system with a good performance and future-proof base. One could almost ignore the workmanship flaws, if it wasn't for the installation problems of the already small 4 GB flash memory. Without a memory card, the user could face significant restrictions in the use of the X7. Especially since a reset of the device did not fix the problem. Because of this issue, we have lowered our impression rating. If you do not use memory-intensive application and are looking for smartphone with a large display, to mainly use for browsing, calls and emails, the X7 could be a inexpensive option. Technical enthusiasts and gamers would not enjoy the device. In the CECT shop there is even an Elite edition of the X7. It features the more powerful SoC MT6589T, whose CPU works at 1.5 GHz and the GPU at 357 MHz. 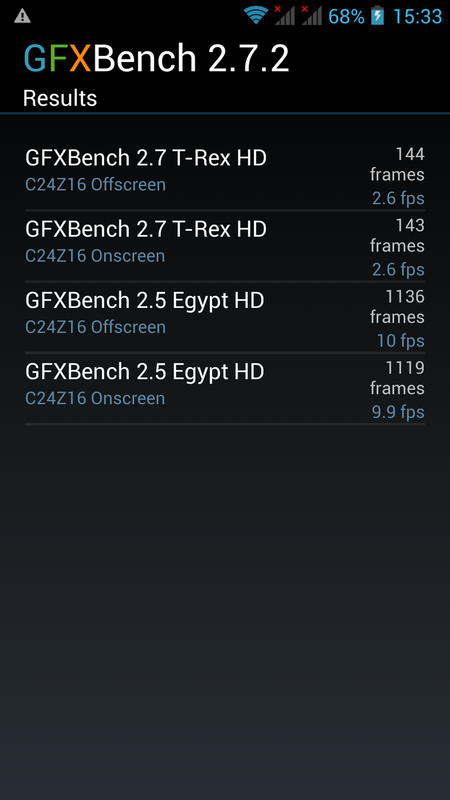 In addition the RAM is doubled to 2 GB and the internal memory is increased to 32 GB. The X7 Elite costs only 50 Euros (~$63) more. 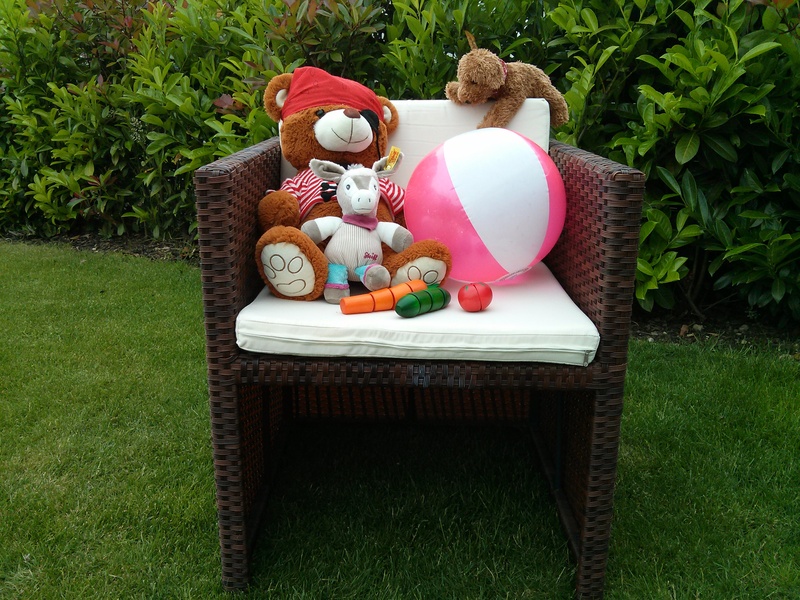 The accessories are largely standard. 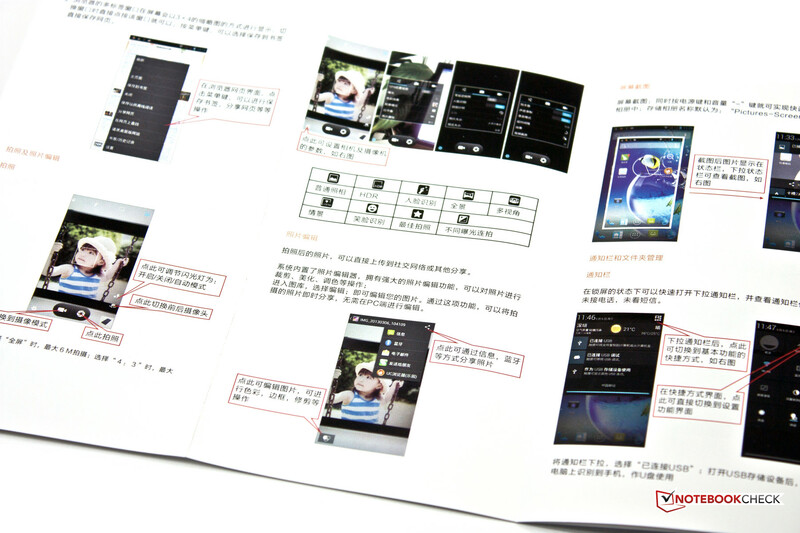 The manual comes only in Chinese. 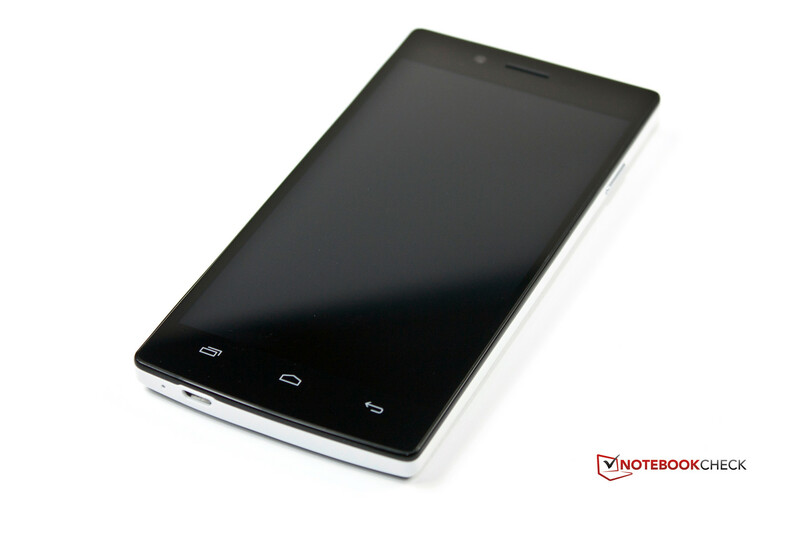 The iOcean X7 is impressive with its 5.0-inch display. 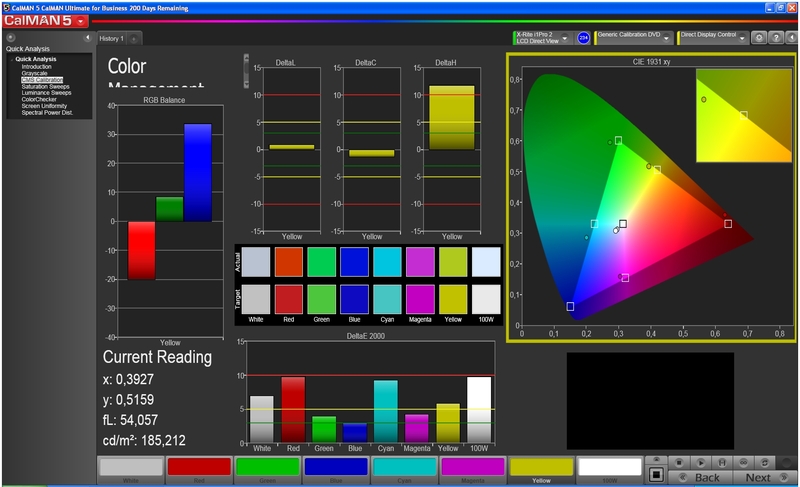 The IPS screen has a Full HD resolution. This is quite remarkable. The back of the test device is white. 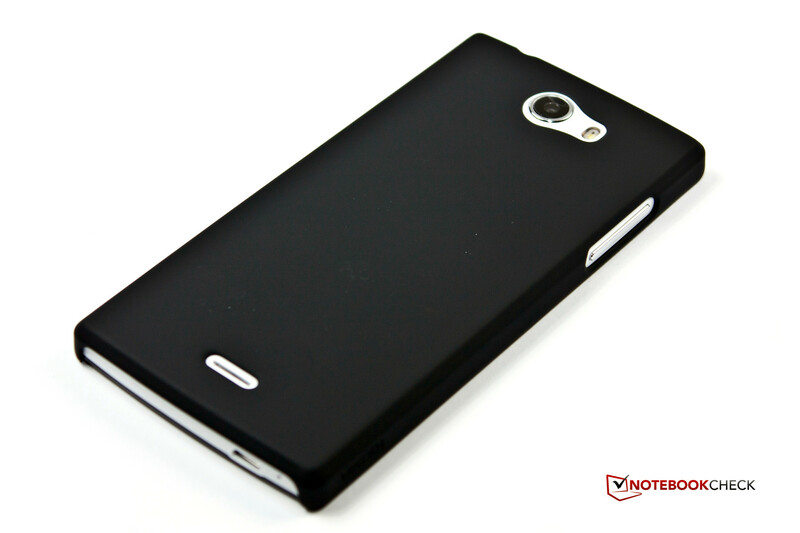 The optional case should protect the device. The smartphone case fits like a glove. The main camera has a resolution of 12 megapixels. Thanks to the recess, the back cover is easy to remove. 15 plastic hooks hold the cover in place. One memory card slot and two SIM card slots. The speaker promises 3D sound. 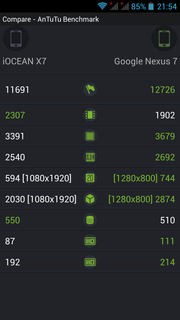 AnTuTu Compare: X7 vs. Sony Xperia 7. No break for our test device. 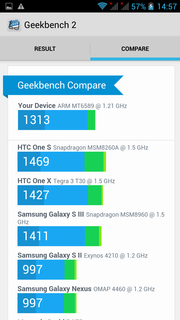 Certainly not against the HTC flagship. 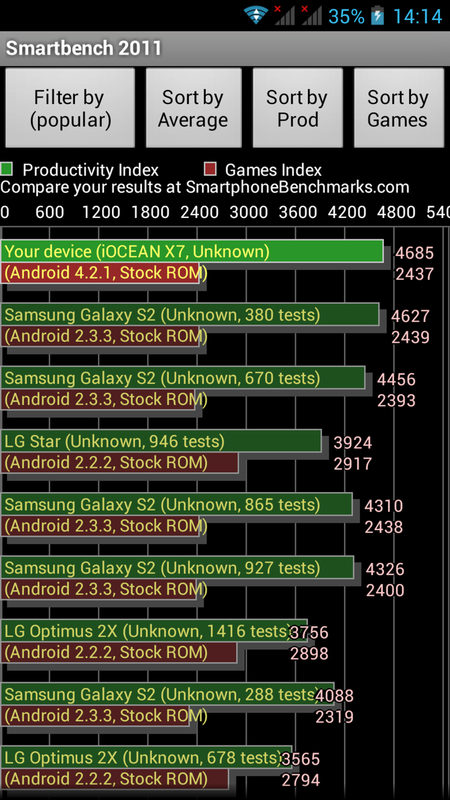 Surprisingly the X7 leaves the Samsung Galaxy S3 behind. In 2D graphics the X7 is on the level of the Galaxy S2, in the 3D performance only on the level of the GT-i9000. Great value for money for a powerful smartphone with a current Android version and quad-core processor. The memory is not fully usable. This cannot be remedied without deeper interventions into the system (rooting). We did not expect a Full HD screen of this size in the price range below 200 Euros (~$255). Google Nexus 4, Amoi N828, Sony Xperia E dual, Samsung Galaxy S DUOS.